Rolling two dice and taking the highest (2DTH from here on) is one of my favorite recent discoveries. I never saw this back in my Second Edition days. The first place I came across it was probably at Grognardia, perhaps one of the Dwimmermount session reports. I would be interested in knowing the ultimate provenance though. Is 2DTH a recent innovation, or can it be found in any of the classic writings? Philotomy has a similar rule in his OD&D musings, so maybe that is where it came from. I like 2DTH so much because it allows you to skew probabilities in a particular direction without introducing bonuses or eliminating any possibilities. Also, though you are literally rolling more dice, it still feels like a single roll, and thus does not seem to bog pacing down as something like an additional attack roll might. 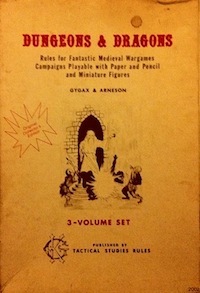 Other editions have addressed similar problems by adding bonuses (the Third Edition family and Second Edition to a slightly lesser degree) or eliminating randomness altogether (such as HP in Fourth Edition). I’m sure there are many more as well. The d4 is the simplest interesting case (the curve shift is not as obvious with a d2). Obviously, two dice take lowest (2DTL) can also be used to skew the probability curve in the other direction, though I have found less use for this. Perhaps for situational modifiers. This entry was posted in Uncategorized on December 13, 2011 by Necropraxis. I’ve seen it in the same places that you have, as well as 2DTL, but don’t recall seeing either anywhere before the current millennium. i usually see it in connection with daggers doing 2DTL and two-hand weapons doing 2DTH. I use 2DTL and 2DTH for light and heavy weapons, respectively. It works really well. I’m also a fan. My current thinking on HP (for S&W:WB) is that, since HD are re-rolled at each level increase, then all characters roll 1 HD for 0 level and 1 HD (or 1+1 for Fighting Men) for 1st level, taking the higher of the two. I want to use 2DTH for weapons that do 1+1 in S&W:WB, 2DTL for those that do 1-1. For dual-wielding, I’d give a +1 to hit. That gives players a range of options: heavy weapons for damage, shield for defense, dual-wield for offense. Light weapons are mainly for situations in which regular or heavy weapons are inappropriate. I’ve become very leery of bonuses, but that is a nice breakdown between dual-wielding, two-handed weapons, and shield-use. I was leaning towards treating dual-wielding and two-handed weapons mechanically the same, but now I’m considering your scheme as well. It’s easier to handle the occasional ‘to hit’ bonus in S&W:WB because they are so few and far between in the first place. The first place I saw this in relation to D&D (& two-weapon fighting) may have been Dragonsfoot. There was an old Avalon Hill game called Magic Realm that used 2DTL. DTH is a good way to add bonuses that don’t pile up and get out of hand. 2D4TH has an average of 3.13, but now matter how many D4TH you roll, you’ll never reach an average of 4- there’s a hard limit on the bonus. For an extreme example 2D(high#)TL would make a neat chaos-infused weapon. I believe that Warhammer Fantasy Roleplay used this for damage rolls with certain weapons. I just noticed your comment was pending for approval. Apologies for the delay! Adding an extra d6 to a roll is not too different from a +1, mathematically, so it can be a nice way to use bonuses and penalties in B/X-style “roll a d6” mechanics, like encounter checks, listening at doors, initiative, and so on. For instance, if your character would normally get a +1 to initiative, you can have them roll two dice and choose which one to keep. It’s more elegant in some respects, and allows you to keep all possible results on the table (even if the bonuses or penalties grow significantly larger).